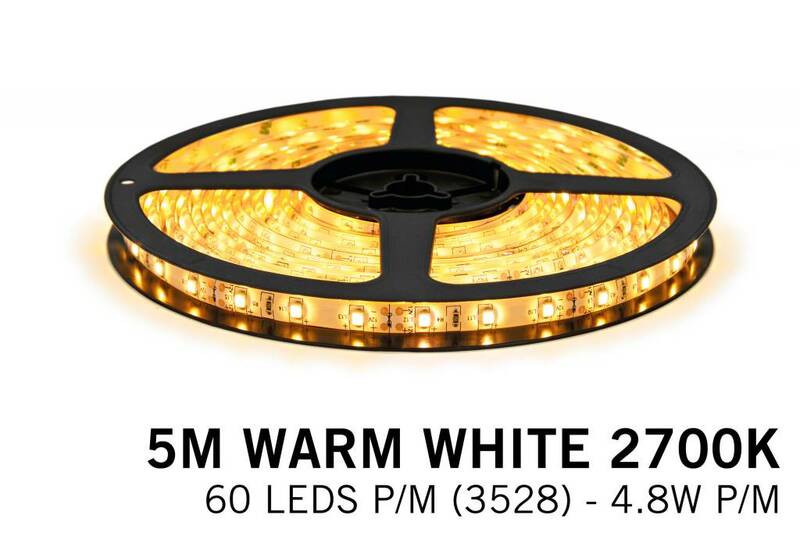 Warm White LED strip (2700K) 60 LED's p.m. type 3528 - 5M - 12V - 4,8W p.m. Warm White LED strip with 300 LEDs. 5 meter dividable LED strip, ideal as accent lighting with very low power consumption of 4.8 watts per meter. The 300 type 3528 LEDs with a color temperature of 2700K produce a full warm white light. 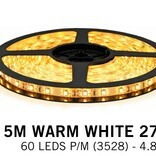 LED strip warm white 2700K: This 5 meter warm white LED strip has a very low power consumption of 4.8 watts per meter. Create the perfect accent lighting for example under bookshelves or places where you want a nice mood lighting. The LED strip has a warm atmospheric color temperature of 2700K, similar to the hue of a dimmed tungsten bulb. Thanks to the splash proof coating this warm white LED strip is also suitable as a light source under kitchen cabinets or in the bathroom. We constantly invest in research for the best and brightest warm white LED strips for a competitive price. You will notice this on the light output and durability of this product. Luminous Flux: 2400 Lumen / 5m.